Balustrade regulations in Australia are governement by the National Construction Code 2015. This code provides guide lines for balustrade construction, materials and heights restrictions. A balustrade is defined as a rail and its baulsters, including timber, metal and glass. The NCC remains largely unchanged since 2005 with proposed amendments in 2012 unsupported by the Australian Building Codes Board (ABCB). A copy of the NCC is now available free online here. One of the first steps when planning your wire balustrade is to have an understanding of the different wire types that are available, the most common wires used for balustrades are 3.2mm 1 x 19, and 3.2mm 7 x 7 wire (also described as 3mm wire). 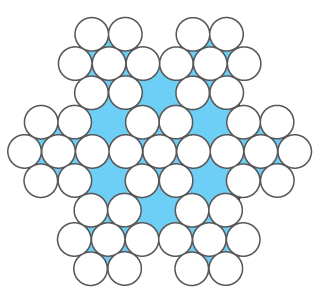 3.2mm refers to the diameter of the wire, and 1 x 19, and 7 x 7, refers to the construction or lay of the wire I.E. 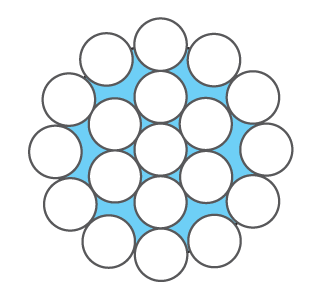 1 x 19 wire is made up of 1 single wire with 19 strands, where as 7 x 7 wire is made up of 7 wires with 7 strands within each wire, below is a diagram showing the make up of each of these wires. 1 x 19 - Is a very rigid wire making it very well suited for wire balustrades, however it cannot be hand swaged, making it only suitable for hydraulic swaging. 7 x7 - Is semi-flexible wire making it the perfect choice for balustrades where hand swaging is being used. Will the regulations apply to my balustrade? It may be possible that your wire balustrade will not need to comply with NCC regulations; below are some common situations and how you can deal with them. My deck has a drop off less than 1 metre to the area below, what do I need to do? If the bottom of your deck is less than 1 metre off the ground, then the regulations will not apply to you. It is up to you to decide the most appropriate level of safety, wire spacing and how many support posts you use on your balustrade. My deck has a drop off more than 1 metre to the area below, what do I need to do? You will need to fit your wires and posts according to NCC Regulations. Below is the applicable table for doing horizontal wire balustrades. My deck has a drop off more than 4 metres to the area below, what do I need to do? In this situation you are not allowed to use horizontal wires and instead they will need to be vertical. This process can become slightly more complicated, please contact us at info@miamistainless.com.au or call us at 1800 022 122 for advice on how to design your vertical balustrade. Can I use wire balustrade around a pool? You must use vertical wire balustrade around pool areas to prevent climbing. It is recommended that you contact a Miami Stainless sales consultant to help you decide if vertical balustrade is right for you. What works best when installing horizontal wires? 3mm 1 x 19: We have found that when using 3.2mm 1 x 19 wire rope, having your posts spaced at 1200mm and your wires at 80mm spacing is the easiest way to ensure the tension required for your balustrade will be easily achievable and will pass inspection. 3mm 7 x 7: We have found that when using 3.2mm 7 x 7 wire rope, having your posts spaced at 1500mm and your wires at 80mm spacing is the easiest way to ensure the tension required for your balustrade will be easily achievable and will pass inspection. This means that a balustrade with wire support posts every 1200mm or 1500mm, and a top rail height of 1 metre (960mm to the underside of the handrail, plus a 40mm handrail is most common) will require 11 runs of wire when spaced at 80mm with a tension that will be easily achievable. 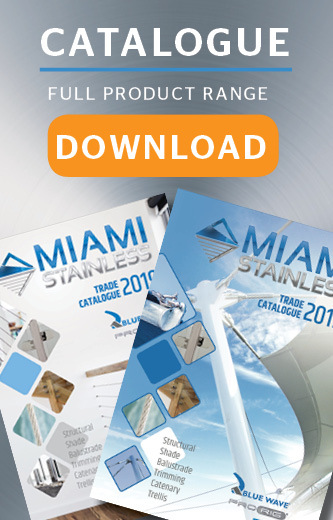 Please note: The above recommendations are the opinions of Miami Stainless derived from their own testing and experience and are intended as a guide only. In some situations, it may be more suitable to use different wire or posts spacing. 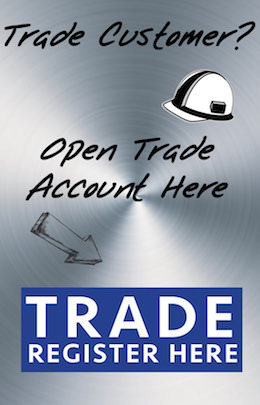 Please email us, info@miamistainless.com.au or call us on 1800 022 122 if you are unsure or you require any advice. In order to satisfy the NCC 2012 regulations for horizontal wire balustrade, your system must either meet the tension requirements set out in Table D2.16a / 3.9.2.1; or must not exceed the maximum deflections set out in Table D2.16d / 3.9.2.3. Depending on the application, the table below could be labeled as Table D2.16a or Table 3.9.2.1, however it is the same in both cases. Volume 1 (Table D2.16a) applies to class 2 to 9 buildings, which are generally commercial applications. Volume 2 (Table 3.9.2.1) applies to class 1 and 10 buildings, which are primarily residential applications. Depending on the application, the table below could be labeled as Table D2.16d or Table 3.9.2.3, however it is the same in both cases. Volume 1 (Table D2.16d) applies to class 2 to 9 buildings, which are generally commercial applications. Volume 2 (Table 3.9.2.3) applies to class 1 and 10 buildings, which are primarily residential applications.